A large tree on West Chicago Street in Eaton came down during the storm, leaving the home in its path damaged. A storm which ripped through Eaton and Preble County last Thursday, June 18, knocked out power to more than 900 homes. Approximately 17 poles were downed, causing officials to close Ohio 122 West near Camden Road, in Eaton, while DP&L crews worked to get power restored. 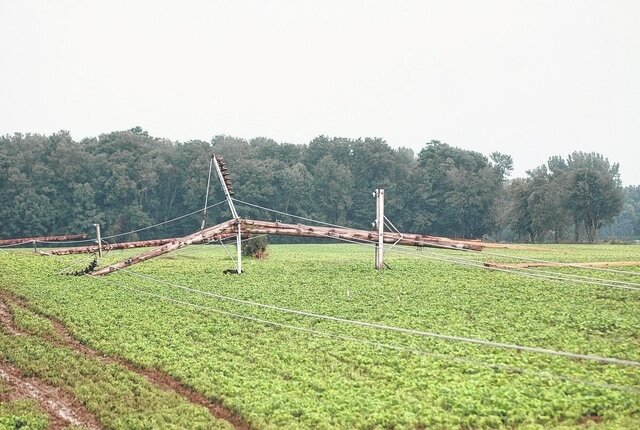 EATON — A severe storm which blew through Preble County on Thursday afternoon, June 18, left Ohio 122 between Winters and Camden Roads closed due to 17 electric poles which snapped, leaving hundreds of residents without power. The resulting damage kept Ohio 122 closed until late Saturday night, and into the early morning hours on Sunday while DP&L crews worked to replace the damaged poles and downed power lines. According to Sheriff Mike Simpson, DP&L sent several crews to the area. Simpson said the poles were part of a major transmission line and power was out on the east side of Lakengren and the west side of Eaton. “It’s going to be a mess out here,” Simpson said Thursday at the scene, noting DP&L said they had a “small army” on the way to work on the damage. The Ohio Department of Transportation set up a detour around the location of the downed lines. DP&L officials reported over 900 homes were without power in the county at one time. According to Simpson, other wind damage and power outages in Preble County were “spotty.” Power was restored to most areas in the county by Friday afternoon, June 19. Trees came down on several streets in Eaton, Waterworks Park, at the Eaton Country Club and other locations in city limits as the storm came through the area between 4:20 and 5 p.m. A sign at the Red Mule Restaurant in Eaton was blown down as well. The National Weather Service reported a home on Dafler Road near West Alexandria had siding blown off. The forecast for this week includes a chance of rain and thunderstorms for the remainder of the week, after midnight Wednesday and thunderstorms likely mainly after 10 a.m. Thursday. Thursday will be mostly cloudy and warm, with a high near 84 and a 70 percent chance of precipitation. Thursday night, the threat contiues, with a 50 percent chance of showers and thunderstorms. There will be a chance of showers and thunderstorms on Friday, with a 40 percent chance of precipitation. That threat carries over into Friday night and Saturday.